Yes, the warm weather will return ... eventually. And in the meantime, you can keep yourself busy and happy dreaming of balmy days and evenings outdoors. If your summer vacation plans include a new patio, do your homework now. That way, you'll be prepared with all the facts you need when it comes time to start the actual construction. Check out this must-know list of patio building basics. Here's how to pick the perfect place for a patio: Give careful thought to what you and your family want most when it comes to open air living. Do you prefer to enjoy every minute of sunshine -- or shelter in the shade? Is there an area of your property that is particularly charming and tranquil for lounging al fresco? Would you like close access to your house from the patio? If your yard is sloping, you might be well advised to select the flattest part. Finally, consider how doable it will be to bring in construction materials and equipment to the spot of your choice. Concrete is inexpensive and low-maintenance. If the word concrete conjures up visions of a bland, ugly gray expanse, take a look at the 21st century styles. Today's concrete patio installations can be tinted and stamped for amazing decorative effects. Do make sure, though, that proper attention is paid to drainage. Allow time for the fresh concrete to cure before walking or placing furniture on your patio. Natural stone is lovely and rustic looking. Plan the patio layout carefully; flagstones are irregularly shaped and require careful fitting. Stone is easy-care and durable, as solid as ... well, a rock. However, it can be slippery when wet and uncomfortable to walk on barefoot in the full heat of summer. Clay brick comes in earthy colors which give a cozy, attractive look to a patio. It can be laid out in appealing patterns. While a brick or two may fade or chip over time, it is a simple matter to replace them without redoing the entire expanse. The downside, though, is that good quality bricks tend to be more costly than other patio materials. Pavers are manufactured of concrete or stone. Available in a variety of colors and shapes, they are easy to work with. 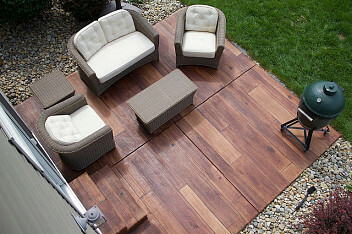 What's more, you'll be able to start using your new patio right after it's installed. Pavers permit optimal drainage and are cooler underfoot than stamped concrete. However, watch out that they do not become a tripping hazard as they settle into the soil. Check with your local building authority before you go merrily ahead with your project. You might not need a building permit for a patio less than 30 inches high, but regulations vary. And be aware that a covered or fenced patio falls into a different category than an open one. If your contractor must remove trees or large amounts of earth, this may also change your permit requirements. Contact a one-call number for the location of utility cables before doing any excavation. In a zone that has restrictions on development, you might need a zoning permit as well. DIY Carpentry – Is it Worth it?